Most teams are lucky to have one All-Conference Defensive Team player…the Clemson Tigers have two. Danielle Edwards (2018 All-ACC Defensive Team) and Simone Westbrook (2016 All-SEC Defensive Team) have continued to shine on the defensive side of the ball this season, making a huge impact in the back court for Clemson. Clemson has been terrific on the defensive side of the ball this season, especially in regards to tips and steals. The Tigers currently sit at 3rd in the nation in steals and 8th in steals per game with 345 and 11.9, respectively. Those marks are good for first in the Atlantic Coast Conference in each category. Danielle Edwards (81) and Simone Westbrook (80) are the standouts in steals for the Tigers, accounting for 46.7 percent of Clemson’s total steals. 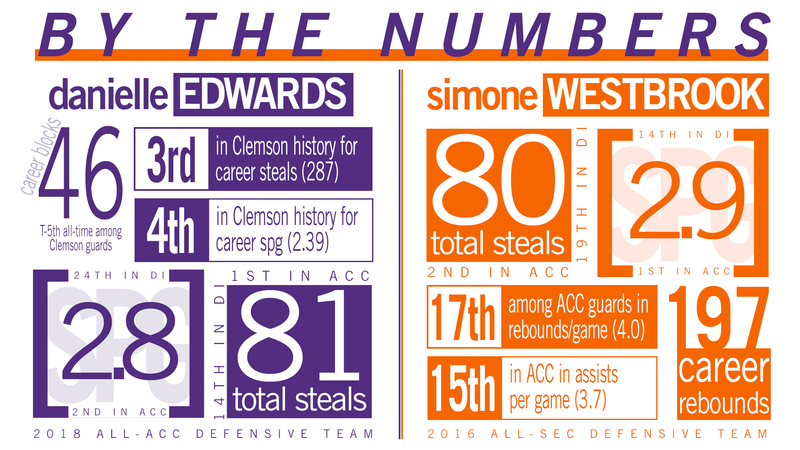 As a senior, Edwards continues to climb the Clemson record book, sitting in third for career steals with 287. If she continues at the rate she is going this season (2.8 spg) she is on pace to take over third place in Clemson history for steals per game. If selected to the 2019 ACC All-Defensive Team, she would become just the third Tiger to earn back-to-back nods, joining the ranks of Erin Batth and Lele Hardy. Hardy remains one of the greatest defensive players in Clemson history, sitting atop the list for both steals and steals per game.